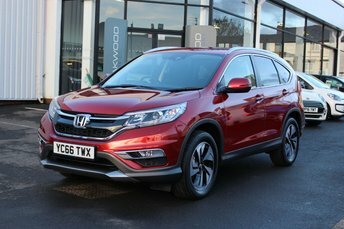 This fantastic example of the Honda CR-V is fitted with heated part leather/alcantara seats, Satellite Navigation with Traffic Reports, Parking Sensors at the front and rear with a reverse camera, Bluetooth telephone and media use, Cruise Control with a speed limiter and USB connectivity. Also featured on this CR-V are dual zone Climate Control with rear vents, DAB Digital Radio, electric folding Door Mirrors, Honda Economy mode as well as a multi function Steering Wheel with paddle shift, Arm Rests and Drinks holders fir the front and rear. This car has been well loved and maintained with regular service. From practical hatchbacks to tough-looking SUVs, Honda's impressive line-up has something to offer every driver. Here at Oakwood Motor Company Ltd you'll be able to choose from an outstanding selection of quality pre-owned cars, all of which come fully tested for your peace of mind. Test drive a used Honda Jazz and decide whether this stylish and spacious city car is the one for you. Alternatively, take a closer look at a used Honda CR-V, a highly capable crossover that's exceptionally versatile. Contact a member of the team today to find a used Honda for sale in Manchester that meets your specific requirements. Call, get in touch through the website or pay us a visit in person.